Dieses Kapitel listet auf, wer ausser dem Staat alles Einfluss auf den ICT-Einsatz in der Schule zu nehmen versucht und weist damit darauf hin, dass die öffentliche Schule nicht (mehr) nur unter dem Einfluss des Staates steht. 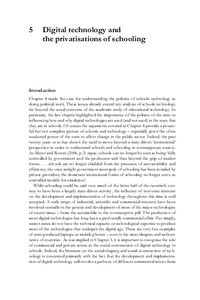 This chapter has highlighted the role of a number of influences on schools technology use that are litde discussed or acknowledged. While the influence of state policy-making is clear, the role of 'other' interests from across the private, commercial and public sectors of society are often more hidden and less obvious. Yet few people could deny that schools are ded to other social institutions such as families, higher education, the economy and the wider public sector. As such it is perhaps unsurprising that digital technology in schools has emerged as a ready focus for the legitimating of a variety of external publics with differing aims and objectives. Much of this chapter has illustrated the wider point that state education is no longer the sole preserve of the state - if indeed it ever was.